I read this article and found it very interesting, thought it might be something for you. The article is called Pineapple Upside-Down Cake Recipe and is located at http://eugeniekitchen.com/pineapple-upside-down-cake/. Hi! Do you love pineapple? I do! Today I made this pineapple upside-down cake. This luscious cake is one of my mother’s favorites. Even this scrumptious cake has a very delicious and homey look with oozing yellow pineapple and red cherries. I wanted light topping, so I used less butter and sugar. Yet, it is quite a sweet cake with juicy pineapple on top. Have you already tried my French apple upside-down pound cake Quatre-quarts aux pommes? 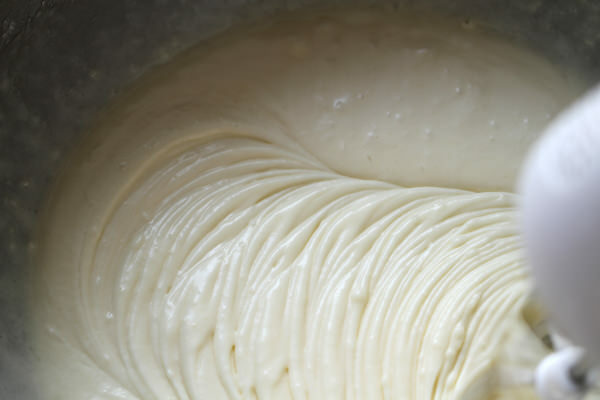 This pineapple cake batter is not rich and hard as pound cake. It is more soft and moist. And it’s easy to make. How about surprising your family with this beautiful cake this week? 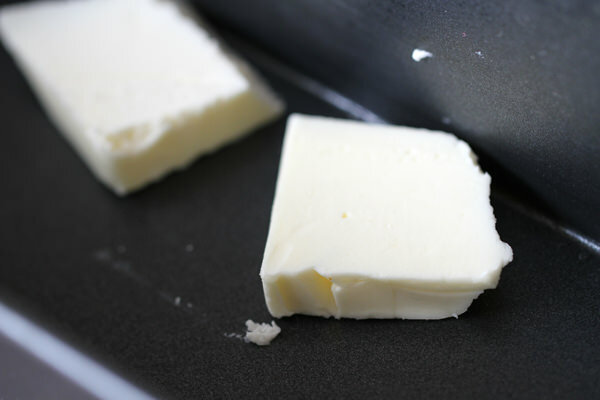 First, brush the baking pan with melted butter. Add in light brown sugar and coat evenly. Then arrange pineapple on the bottom. 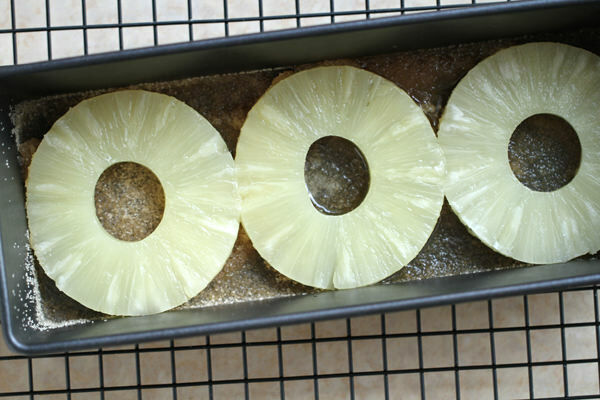 And fill the corners with small pieces of pineapple. 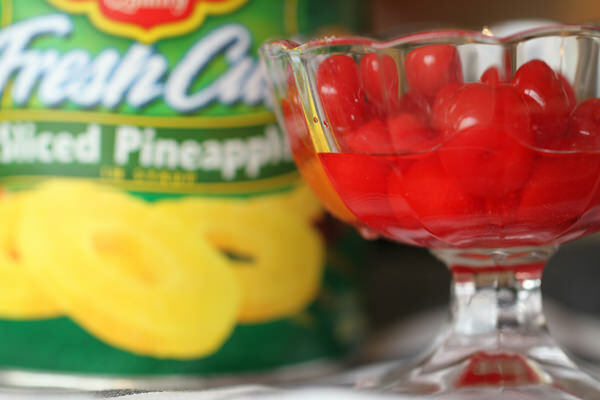 And fill the holes in the center of pineapple with cherries. And set aside. And in another mixing bowl, break in an egg. And add in sugar (I am adding less sugar comparing to other recipes. ), salt, vanilla extract and cream together until white. 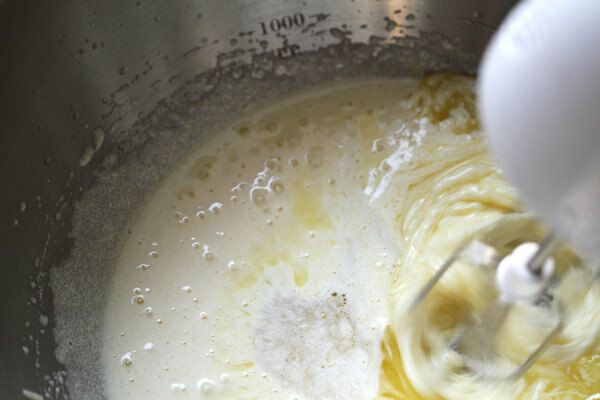 Then add in melted butter and whisk rigorously until blended. 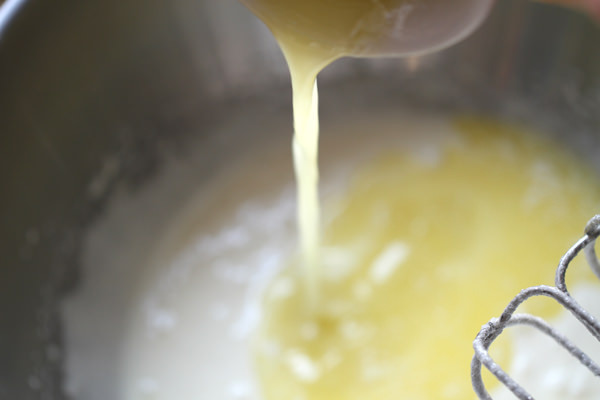 The melted butter should be cooled before using and this process is important if you don’t want butter leaked out of cake when baking. 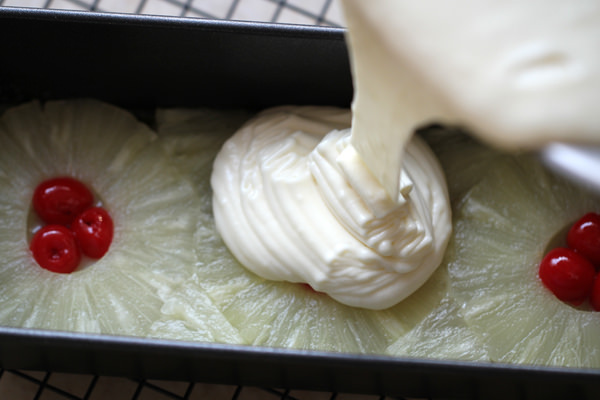 And add in milk and pineapple puree. I made pineapple puree, blending 2 oz of pineapple cubes with 2 tablespoons of milk from the ingredient. And whisk to combine. Finally add in flour and baking powder mixture all at once and fold until combined. The batter is a bit lumpy, but it’s okay. Now pour the batter in the pan. It should be only 2/3 full. Bake for 50 minutes to 1 hour at 350 degrees F (180C), or until puffed and golden brown. An inserted wooden stick should come out clean. Cool on a wire rack for 5 minutes. Then place a serving plate upside down over pan and turn plate and pan over. Today I am using a cake stand. 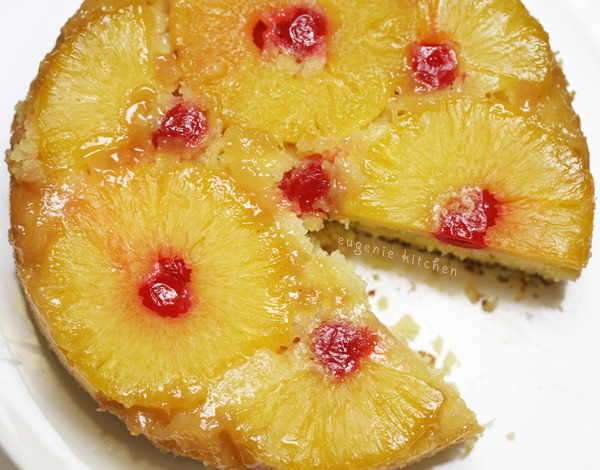 This is a pineapple upside down cake which is full of tropical flavor. 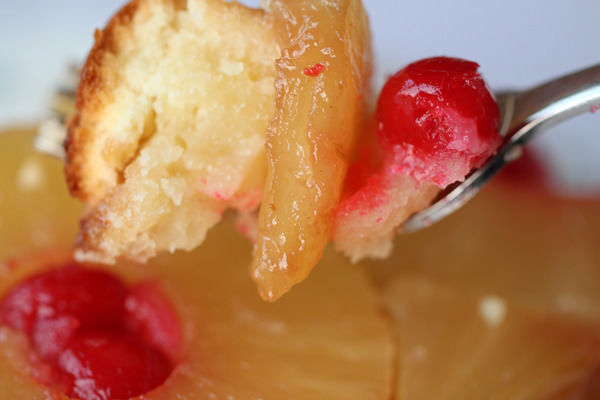 Do you know most of pineapple upside down cakes are too sweet? This is not. It is just sweet. Everyone loves it. Coat the light brown sugar on bottom. Beat in egg, salt, sugar, and vanilla extract. Add in melted butter and whisk until well blended. Combining water and oil is emulsion. Add in milk and pineapple juice. Then beat to combine homogeneously with electronic mixer. An inserted wooden stick should come out clean. Pineapple upside-down cake – Done! Light cake flavored with pineapple juice. Please allow my family to move in with you. Your desserts are delectable! can you make video for vanilla cake please :) thanks in advance. and this pineapple upside down cake, am gonna try it today.